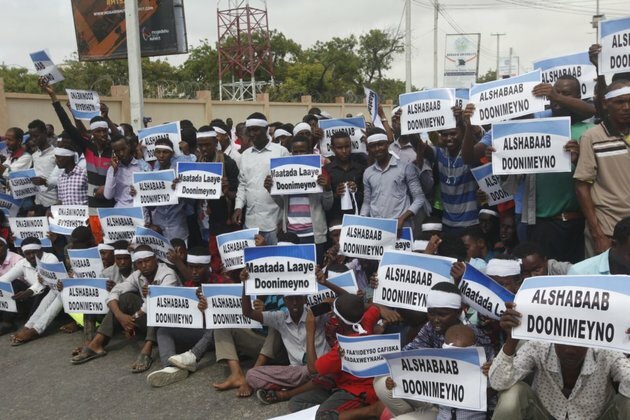 Hundreds of mourners and government officials in Somalia gathered Sunday at K-5 junction, where a year ago a truck bomb killed 587 people in the country's deadliest terrorist attack. The Somali government has officially renamed the junction as "October 14 Junction" in respect of the victims of the attack. Mogadishu Mayor Abdirahman Omar Osman "Yarisow" said the gathering Sunday showed how Somali people have rejected terrorism. "Fourteen October 2017, even though it was a black day for Somalia, nevertheless it united Somali people in defiance against terrorists," he said. An armed soldier stand guard at Zobe junction during the anniversary an explosion in the capital of Mogadishu, Somalia, Oct. 14, 2018. Somali Prime Minister Hassan Ali Khaire told the crowd the attackers failed to destroy the spirit of the Somali people. Some families still live in anguish as the bodies of their loved ones have never been found. Ten days after the attack, the rescue committee registered 225 people who were still missing their loved ones. Few have been found alive since, many were burned beyond recognition and some were counted as dead because their bodies were never found. FILE - In this Oct 14, 2017, file photo, people gather to search for survivors by destroyed buildings at the scene of a blast in the capital Mogadishu, Somalia. The October 14 attack also left hundreds of children orphaned. Abdullahi Mohamed Shirwa who led a support and rescue committee appointed by the government has told VOA Somali the victims killed in the explosion left behind 1,547 orphans under the age of 15. "Most of these children have lived in Mogadishu, but there are also children in Galkayo, Qoryoley, Baidoa, Wanlaweyn, and there are also children of people from the Diaspora," he said. His committee collected more than $4.4 million donated by the Somalis in the Diaspora and the governments of Somalia and Djibouti. Between $300-$1,000 was given to the families who lost loved ones and those who were injured. But Shirwa says several charities and a foreign embassy pledged to sponsor the education of 950 of the orphaned children, but have failed to follow up. The committee also informed the Somali government that 597 children have not been sponsored and need government help. "We told the Deputy Prime Minister [Mahdi Mohamed Guled] about the children who are waiting sponsorship, and those pledges that need government follow up," he said. "We also told him the government needs to take responsibility for the remaining orphans," he said. A year later, none of the orphans have received any sponsorship, the committee told VOA Somali. Sunday, the Somali prime minister reiterated the government pledge to offer free education to the orphans. The al-Shabab militant group has not claimed responsibility for the attack, but Somali courts and intelligence officials say they have evidence the group is responsible. Defendants Abdiweli Ahmed Diriye, Abdul Abdi Warsame, Hassan Aden Isak, and Mukhtar Mohamud Hassan appear before a military tribunal in Mogadishu, Jan. 1, 2018, in connection with the Oct. 14 truck bombing in Mogadishu that killed 512 people. Sunday, the Somali government executed Hassan Aden Isak by firing squad, to mark the anniversary. Isak was found to be a member of al-Shabab and was sentenced to death in February after being convicted of helping coordinate the attack. He was caught driving a second vehicle that was part of the attack. That vehicle exploded after his arrest, but no one was killed. A second man, Ibrahim Hassan Absuge, was convicted of buying the truck used in the attack and was also found to have bought other vehicles al-Shabab used in terrorist attacks. He was sentenced to life in prison, but remains at large. A third man, Abdiweli Ahmed Diriye, was sentenced to three years in prison for helping the truck pass through security checkpoints. But the court has failed to bring justice to the main suspects connected with the attack. Among them al-Shabab leader Ahmed Omar Abu Ubaidah, who the Somali government says approved the attack. As Somalia prepared for the October 14 memorials, al-Shabab struck Saturday in the southwestern town of Baidoa, killing at least 20 people and injuring more than 40 others. The United States Embassy issued a statement Sunday expressing solidarity with the people and government of Somalia to commemorate the victims of the October 14 attack. 'This sickening attack, along with the tragic events yesterday in Baidoa, show the extent to which terrorists are willing to go to create havoc and destruction in Somalia," read the statement. "We denounce such senseless acts and will continue to provide our assistance to overcome terrorism and promote stability and prosperity for the people of Somalia."